In September, when Donald Trump admitted, at last, that Barack Obama is in fact a born American, Twitter imploded. Many times, Twitter has also exploded. Twitter has gone both nuts, thanks to Al Roker, and wild, thanks to Trump’s mom. Twitter had a meltdown when the Cubs won the World Series in November. And when Trump was elected president, Twitter freaked out, as it tends to do quite often. Twitter appeared utterly in shock. Twitter lost it over a home-wrecking penguin, which seems like an insignificant thing to “lose it” over. At one point, Twitter even snarked. Twitter, a social media platform magically imbued with human feelings that appears to always exhibit one collective emotion at a time, has a tendency to go crazy, has a dark side and loves to attack, aware perhaps that it has the power to build and destroy. Twitter often throws shade and once slammed Bernie Sanders when his DNC speech pushed back The Bachelorette. All of Twitter at one point loved Ryan Reynolds’ face. 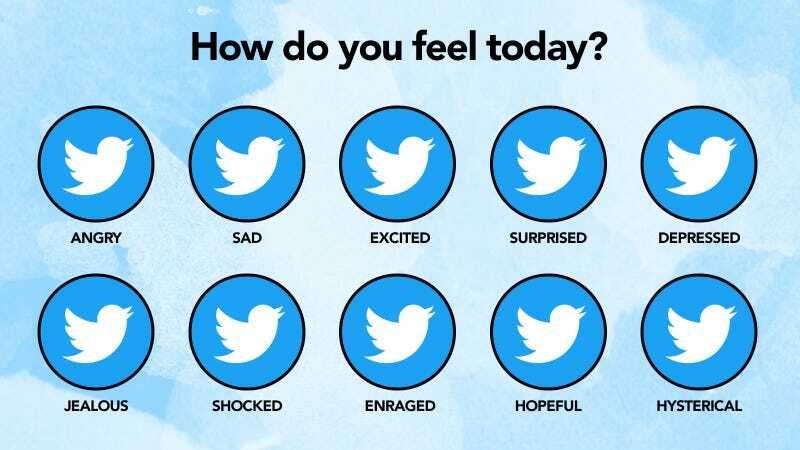 From one day to the next, Twitter has proven to be all over the place, can’t decide what it wants to be, who it wants to be, how it wants to feel, up or down, or how it should move about the world. Twitter struggles to maintain a steady emotional state and simply be okay with who it is. There are times I feel like grabbing Twitter by its muscular forearms and pleading with it to get it together. “Twitter, you need help!” I would scream. And Twitter would scream back, “No! You do!” And then Twitter would run off crying, arms flailing. I would stare at Twitter from behind and wonder why it has to be this way. But I would say nothing in return because what Twitter said is true. We all need help.